Report: How many teachers make the state’s average salary? 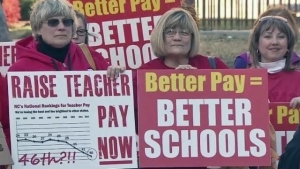 WRAL is offering a fascinating look today at North Carolina’s much-disputed average teacher pay. According to the state, it sits above $51,000 today, a figure that many teachers in counties across the state aren’t making. With an estimated 15,000 teachers planning to advocate for better pay and overall school spending Wednesday in Raleigh, it’s a point well worth revisiting. Today’s report dives into how the state arrives at that figure, and, according to WRAL, the number factors in varying local supplements, leave pay, performance bonuses and more. Before diving into the salary data, it’s important to understand how North Carolina’s average teacher salary is calculated. Alexis Schauss has been in charge of determining that number since 2002. She is director of school business for the North Carolina Department of Public Instruction. Each month, the state education agency collects payroll data for every traditional public school teacher in the state. Their pay is then audited to make sure each teacher is paid according to their license and years of experience and to make sure they have the appropriate licensure. To determine the average salary each year, Schauss uses December payroll data because “the population is fairly stable” that month. The salary data is then downloaded into a mainframe program, which calculates the average. Schauss says it’s important to remember that teachers’ experience levels can impact the average from year to year. “We’re seeing a declining population with teachers that [have] 25 years and above, so that pulls down the average,” she said. How many teachers make $51,214 or more? So, how many traditional public school teachers in North Carolina make the average salary – $51,214 a year – or more? The state education agency wasn’t able to provide this year’s numbers – they’ll be ready after the school year ends. So WRAL News requested salary data from a handful of school districts of various sizes to see what average teacher pay looks like in their area. When looking at salaries, it’s important to note that the state pays the majority of teachers’ salaries, but many school systems give their teachers extra money, known as supplemental pay. Of the 115 school districts in North Carolina, 111 districts pay teachers extra. Wake County public schools pays the highest average supplement in the state – $8,649 – followed by Chapel Hill-Carrboro schools – $7,904. Four school districts don’t pay their teachers any supplement – Bertie, Clay, Graham and Swain. Supplemental pay is included in the state’s average teacher salary calculation. The report asks local school districts to provide their own figures, and, in many cases, teachers in some districts simply aren’t meeting the average. Wake County public schools has 10,326 teachers. 5,619 of the 10,326 teachers – 54.4 percent – make more than the state’s average teacher salary of $51,214. The four highest-paid teachers in Wake County – all ROTC (Reserve Officer Training Corps) teachers – each make more than $100,000 a year. The highest-paid makes $110,323. ROTC teachers’ salaries are based on what they would earn in the military, depending on their service and rank, according to Wake schools’ communications director Lisa Luten. “We are reimbursed by the military for the difference between their military pay and the state teacher salary amount,” Luten said. Fifteen of Wake schools’ teachers make in the low $90,000s and have 20 to 30 years of teaching experience, according to the data. The majority of teachers – more than 9,400 – make between $40,000 and $70,000 a year. Wake County is No. 1 in the nation for National Board Certified teachers, according to Luten. Those who have the certification and advanced degrees earn more money. Durham Public Schools has 2,447 teachers. Durham County’s average teacher salary is $51,520. 1,070 of the 2,447 teachers – 43.7 percent – make more than the state’s average teacher salary of $51,214. A majority of Durham’s top-paid teachers have 20 to 40 years of experience, including an ROTC teacher making the top salary of $101,598 a year. As with Wake County, ROTC teachers’ salaries are based on what they would earn in the military, and the military reimburses the school system for its portion of the pay. Cumberland County has 3,265 teachers. Cumberland’s average teacher salary is $47,864. 1,090 of the 3,265 teachers – 33.4 percent – make more than the state’s average teacher salary of $51,214. The seven top-paid teachers in Cumberland County make $70,000 to $96,000 a year. But the majority of teachers – nearly 2,300 – make between $40,000 and $60,000 a year. Clay County Schools has 103 teachers. 36 of the 103 teachers – 35 percent – make more than the state’s average teacher salary of $51,214. Clay County teachers who make the most money – the top salary is $76,620 – are typically 12-month teachers, veteran teachers, have advanced degrees or are National Board Certified, according to the district. Graham County has 99 teachers. Graham’s average teacher salary is $45,610. 29 of the 99 teachers – 29.3 percent – make more than the state’s average teacher salary of $51,214. Graham County’s highest-paid teacher makes $75,108 and has 28 years of experience, is National Board Certified with a Master’s degree and works 12 months a year, according to the district’s data. The next two highest-paid teachers make $62,590 a year. A majority of Graham County’s teachers – nearly 70 teachers – make between $35,000 and $50,000 a year.